With the advent of reliable, high quality Bluetooth speakers, the once popular speaker dock has been in a bit of a decline as of late. This is why you’ll find it hard to get one that sports the Lightning connector needed to work with iPads past the third generation. It’s a pity, since many of these docks had sizable speakers capable of bass and volume most mainstream Bluetooth speakers are just not able to reach. On the other hand, if you still have an early iPad hanging around, buying a decent speaker dock provides you with the opportunity to turn it into an awesome home jukebox, with access to iTunes and services like Apple Music. If you were in the market for a speaker dock in the early days you may also remember that the prices on these devices were insane. That is luckily no longer the case, as the hysteria around iPads has died down and accessory makers can no longer charge a massive premium. Here you’ll find some of the most promising-looking docks that I could find. Some only support older iPads and some can work with the newer models. Either way, if you are looking for a charging and music solution in one, you’ll probably find the right product here. The days when Sony was the absolute last word in electronic quality are long behind us, but the company has not exactly fallen far. Sony is still a premier, top-tier maker of all sorts of electronics. Still, there are more middle-of-the-road Sony products on the market today than I would have believed there would be 20 years ago. One place they haven’t lost their touch is in the design department. This dock looks great. It reminds me of modern, high-end audio equipment. It also has other clever features, such as a place to stow the remote, and a carry handle built right in. Reportedly the sound on this device is really good, which is the least I expect from Sony. Apparently, the volume is only average. Since this is a lightning connector dock it is compatible with all Apple devices that use that connector. It’s portable, slim, and beautifully designed. Best of all? It’s under $100. iHome has been making these since day one as far as I can remember. 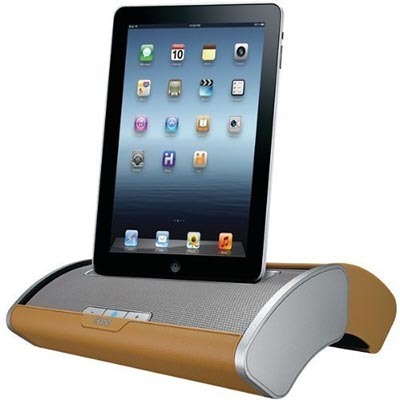 I actually had an iHome speaker dock which I had to give away with my last 30-pin iPad. The design of this iDL45BC seems virtually unchanged since then on the outside, other than the Lightning Connector support it now has. 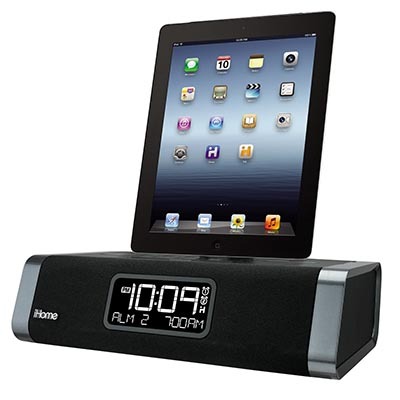 The iHome is more than just a speaker dock, it is also an alarm and radio combo. Even when the iPad is not connected you can still use it as a bedside alarm. iHome also has a bunch of companion apps that let you set alarms and make playlists and things. Honestly, I doubt anyone ever actually uses them. You can also use your own cable via USB – not as elegant, but it should let you use the iPad in landscape mode, which should work great for movies. There is also an aux-in jack. Really, the only type of connection this dock doesn’t have is Bluetooth and I’m totally OK with that. After all, if I want my iPad to physically sit on the thing and charge, Bluetooth is not exactly a priority feature. What about the audio quality? After all, that’s pretty important. Based on the subjective responses of people who have actually listened to it, it seems that the audio is very satisfactory. It’s obviously not going to beat a $400 Bose speaker setup, but for the average person it will be a great improvement over the built-in iPad speakers. Overall this seems like a good, fairly future-proof dock. There are, however, a few negatives I picked up. Several people report that the charge function stops working after a year or two and apparently the viewing angles on the clock numerals are pretty bad. Still, at under a hundred bucks I would totally go for this and if you do get a bad one you could always return it. Think of this as the affordable luxury model. Sure, the polish is missing in the details, but you’re enjoying it too much to really care. 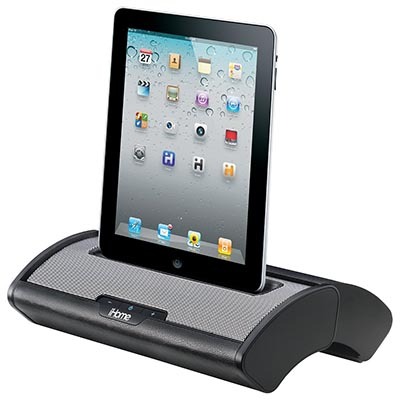 This is one of two vinyl-trim docks from iHome that I review on this page. Unlike the other one, though, this one supports both 30-pin connectors and the newer Lightning connector. The sliding vinyl cover is also more prominent here. This dock can run off either battery power or an AC adapter. The sound is decent; the unit is nice and portable. The cover makes it attractive when not in use, but I do see some people complaining about problems with their deliveries. These do not reflect on the product and the supplier should sort it out if it does crop up. The fact is if I wanted a single dock to travel with me and do duty at home this versatile product is what I would want, and it has an affordable price to boot. Vizio is known for producing some of the best value HD TVs on the market today. Over time they have built a reputation for affordable electronics that have the same or very nearly the same specifications as more expensive brands. This dock from the company focuses specifically on audio quality, and to that end it had a four speaker array and a dedicated 4” subwoofer. The company states that this is designed to fill a room with rich, full range sound. Based on feedback from buyers, Vizio has really achieved what it set out to do. The sound fidelity is very good indeed, although the optimal to achieve that fidelity may be a little less than “room filling”. There are also a few complaints about the remote not working, but this seems to be a fixable bug for the most part and is secondary to the excellent audio quality. Although Vizio’s foray into speaker docks may not be perfect, if you want great audio without shelling out hundreds of dollars, this may be the speaker dock for you. First off, this dock is “universal” in the sense that it can accommodate a wide range of devices, but it doesn’t actually charge the device. 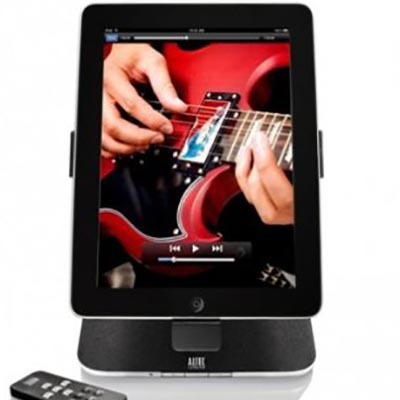 Really it is a speaker and stand combo, but that is not necessarily a bad thing. I very much like the pyramid design of this device. It’s stable and practical while also looking good. It runs off four AA batteries, so it may be a good idea to invest in some rechargeables to avoid the alkaline battery tax. The stereo sound of this unit is described by buyers as “OK”, which, given the very low price, is really all that I would expect. Since this can hold the device vertically or horizontally it seems like it would be great for watching movies in a hotel room or on a camping trip. The build quality is a bit troubling, though. Quite a few people seem to experience problems where the unit stops working after a few months. It doesn’t seem to be a very common issue, but it is worth keeping an eye on. To have some perspective, though, this is a really cheap product, so you have to manage your expectations. In fact, I would feel more comfortable taking something like this to the beach or gym than something that costs a great amount of money. Altec Lansing has always been a rather respected name in computer sound, although it has been a while since I have heard anything from them. This MP450 speaker is clearly an older product, though, as it is meant for 30-pin devices. Still, it is going for an absolute bargain price and, historically, products that carry the Altec Lansing brand have been of a high standard. One great thing about this dock is that it pivots so that the iPad can be in either landscape or portrait mode. That makes this the ideal way to convert an older iPad into a streaming TV device. You can also adjust the tablet’s viewing angle. The MP450’s entertainment ambitions are made even more clear by the inclusion of a remote control. This all sounds great, but I see a lot of complaints about build quality and compatibility problems with the iPad 2. The product is quite old at this point, but it represents a great design idea and concept. It is just a pity that the execution was a bit of a miss. Xtrememac is another brand that I have never heard of. When tablet computers took off there were a slew of unknown names all around suddenly. This is another older product that is still being sold, although it is now priced at a song. It’s officially compatible with the iPad 2 and 3. What makes this dock interesting to me is that it is powered by the iPad itself, making it convenient and portable. Obviously this means the iPad is not being charged and it also means that these are pretty low-powered cans. I like the idea, but once again the execution leaves much to be desired. Low volume, flimsy construction, and cheap materials all make for a product that probably does not deserve your money. 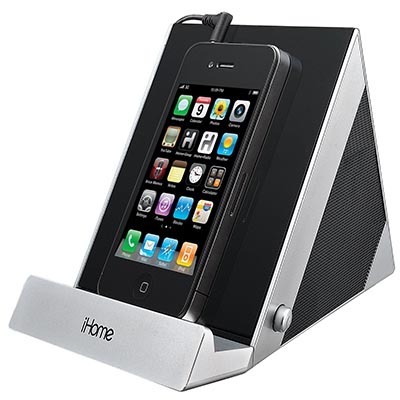 This sleek and portable speaker dock from iHome is also designed for use with older 30-pin connector devices in mind. It has a sliding, vinyl trimmed cover which may be appealing to certain people, although I am not much of a vinyl fan myself. The sound quality from this portable speaker dock is quite impressive, according to people who have bought it, with decent bass and fair stereo separation thanks to iHome’s design. The dock will also charge your iPad, but I’d recommend using the AC adapter for that rather than the four AA batteries. You can also use it to play audio from devices that are not compatible, via the aux-in port. Although there are plenty of docs that sound better, even from iHome, this dock provides plenty of value and keeps it simple. If all you want is improved audio and the ability to throw it in a bag without spending a bundle, this is a good choice. I think that the Bluetooth speaker has not yet killed off the speaker dock completely. There is still a good argument for the superior sound and better display adjustment possible with a dock and, of course, many of them will also charge your device. 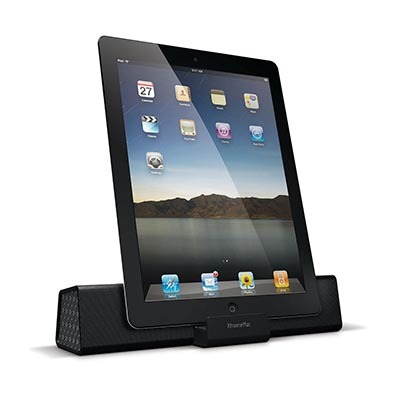 Both products provide sound, but a dock is also supposed to provide a stylish place for your iPad to rest when you are not using it; ensuring that you always have a fully-charged tablet when you need it. 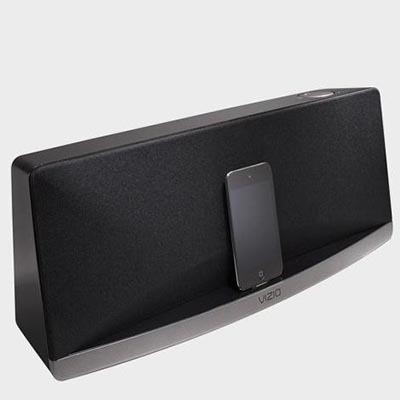 A BT speaker is also something that is almost completely functional. You take it out when you need it and put it away when you are finished with it. 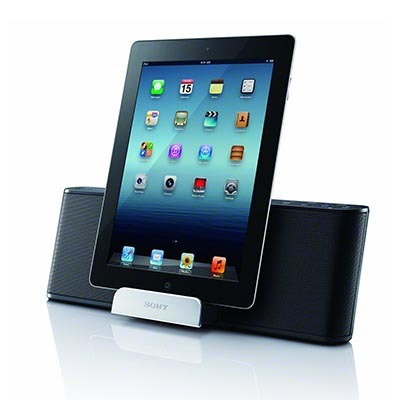 A speaker dock is meant to be displayed as a feature of a room. It is definitely more attractive than just leaving your iPad lying around with a cable sticking out of it. You also can’t argue with the additional bass and sound clarity that come from speakers that have not been designed with compactness in mind. To get the same audio quality as a larger dock speaker from a small portable Bluetooth unit will cost quite a bit more. It’s up to you to decide which consideration is more important. One thing is definitely true – now that these docks are no longer as popular as they once were it is the perfect time to pick up a good deal, so get out there before they are sold out.